Where Have All the Phone Booths Gone? "Originally I thought of a situation where a guy gets up to heaven, and it's where all these things have gone," Mort Gerberg says about his 2012 cartoon for The New Yorker. "But then I thought, this is just somebody who's been cast away." Known for his clever combining of wit and social commentary, Mort has been a working cartoonist since the '60s. 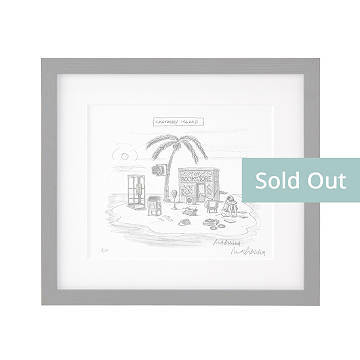 "Castaway Island" is one in a series of limited edition prints we're offering (just 10 of each), numbered and signed by him with the same pen he uses to draw. Framed in solid ash wood with a double-thick mat, it's a gift for the person who enjoys art with a wink. Printed and framed in Oregon.